As more and more people are turning to the web for buying virtually everything, it has opened up a sea of opportunities for online businesses. Entrepreneurs can now far widen their reach beyond their local area benefitting their businesses. WordPress and WooCommerce have enabled a lot of small and large scale businesses to expand their reach and make their online presence. Once you have set up your and start to get sales, there are a lot of things that need to be done which includes printing documents including shipping documents and invoice. WooCommerce allows you to generate, print, and send invoices every time a user places an order. An invoice is a document that includes the details of the items or services sent by the seller to the buyer. The invoice is a statement specifying how much the buyer owes the seller for a particular purchase. Invoice is an important and mandatory document in a transaction. There are a lot of purposes for which an invoice is used and it serves as the proof of all transactions. The fundamental purpose of an invoice is bookkeeping of the company’s transaction history. It helps to keep track of all the information about a sale which includes the date of the sales, the products sold and the quantity of the products sold, the amount of money paid or due for the customer. From the customer’s perspective, an invoice breaks down the information about the amount the customer is paying in taxes, for the product and other information. It is very important for tax purposes to keep a record of all the sales and the transactions. They serve as a proof of the information that you provide on the tax forms. Usually, an invoice includes the following sections. At the top of the invoice is the logo of the company providing the goods or services to the buyers. And usually on the top middle is the word invoice that strikes directly to inform that the document is an invoice. This is the unique number that will be used to identify a particular invoice and thereby a particular transaction. This unique number is used to identify and track a particular order. This is the date that the invoice is generated. The payment by the buyer is due starting from this date. This includes the selling company’s name, address and other contact information. This includes the buyer’s name, buyer’s address and other contact information. The total charges for the products or services purchased from the buyer. This includes the subtotal, shipping costs, discounts (if applicable), tax amount and the total amount due pay. The terms of payment specified by the seller, like the time period that the payment should be completed, the payment method etc. 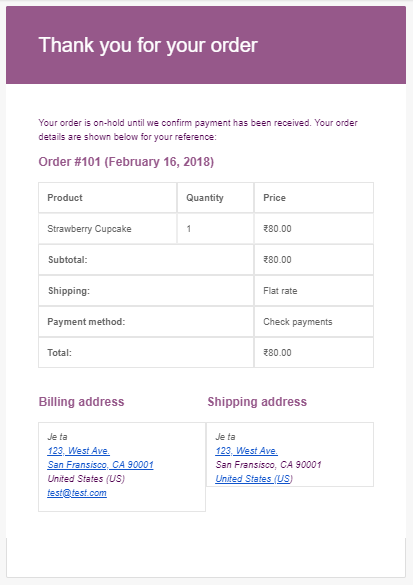 Every time a customer places an order and the status of the order is in pending, an invoice is generated and send to the customer’s email address. To create an invoice, you need to create an order and change its status to pending. To generate an invoice first we need to create an order, on the WordPress website. Go to WooCommerce > Orders and click on Add New. Enter the details of the new order that you are creating. The order number will already be generated for you. Next enter the date when the order is created, enter the order status and enter the customer name. To add a customer, you should have added the customer and the customer details on the user page. Next, add the billing details which will include the ‘from’ address and then add the shipping address which will include the ‘to’ address. Next, click on Add items to add the items in the order. Now you can add the products, their quantity, fee, shipping charges and taxes if applicable, and then save. You can also add custom fields to the product and add permissions for downloadable products. After you have added all the order details, go to Order Actions and then click on Create. This should send an email with the invoice of the orders to the user’s email account. With WooCommerce you can easily set up an online store do all its basic functionality, but Woocommerce plugin alone is not sufficient for dealing with complex B2B functionalities. When it comes to generating an invoice, WooCommerce does generate an invoice that is sent to the email ID of the customer but it does not give much of control on the generated invoice. 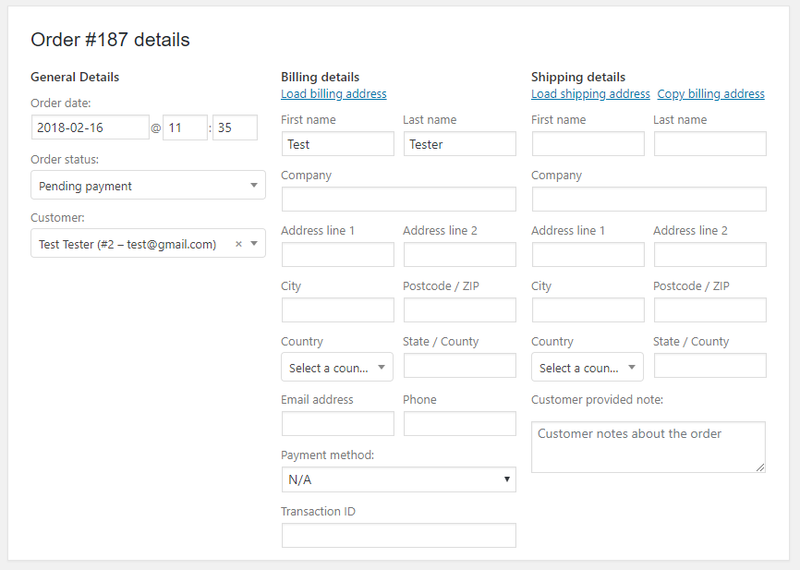 In the invoice generated by the WooCommerce plugin, you do not have much control over how the generated invoice look, what data are included on the invoice, or which ones you want to avoid. 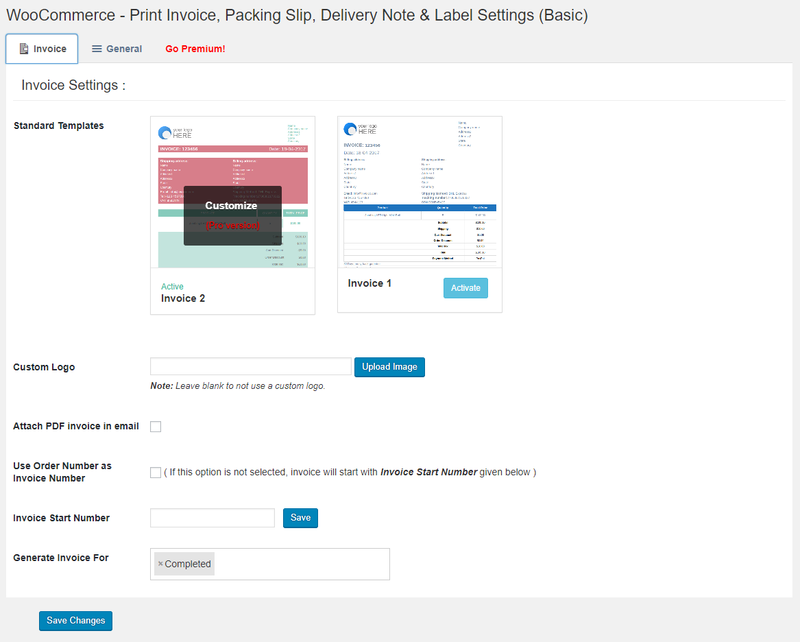 Also, you cannot print invoices from the WooCommerce orders page. Most of the times companies require to print out the invoice for an order so that it can be included with the shipment of the order. Luckily, WooCommerce can be easily extended using different plugins. There are a ton of plugins that can extend and add to the functionalities of WooCommerce to meet the needs of bigger more complex businesses. Specifically for generating and printing invoices, there are some really helpful plugins that can help you print an invoice for customer’s orders. Examples of plugins that facilitates the printing of invoice include WooCommerce Print Invoice & Delivery Note, WooCommerce PDF invoices, and packing slips, WooCommerce PDF invoices plugin etc. 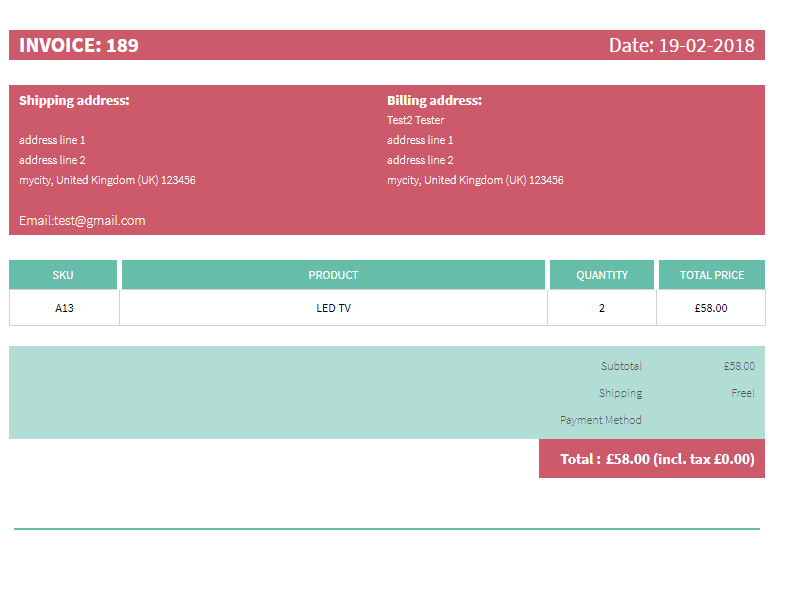 In this article, we will use WooCommerce PDF Invoice plugin to demonstrate how we can generate an invoice for an order, send it to the customer’s email as a PDF attachment, and print the invoice for a particular order. This is a free plugin that allows you generate and print invoices for any order from the order page. First of all, you will need to install and activate the plugin in your WooCommerce store. After you have installed the plugin, you can go to plugin Settings page to change settings and add the details like the shipping address and other generic settings. From the plugin Settings page, the invoice settings tab, you can see the two templates that you can activate the template for your invoice. The plugin also gives you the flexibility to add a custom logo that appears on the invoice so that the logo matches your store. To send an invoice to the customer’s email ID as a PDF attachment, all you need to do is to check the box to Attach PDF invoice in an email. This will send an email every time an order is generated. With this plugin, you can also determine in what statuses of an order an invoice be generated. This plugin also auto-generates invoice number starting with the number you provided or you can choose to use the order number as the invoice number. The general information to be included in the invoice document are added to the General settings tab in the plugin settings. 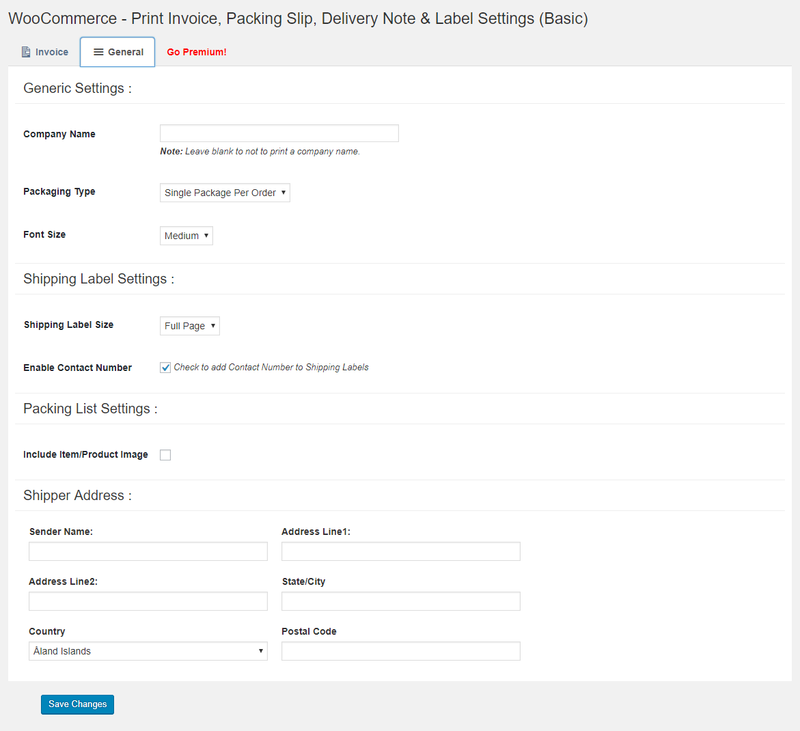 To print an invoice for a particular order from the Order page, go to WooCommerce > Orders. Go the Actions column for the particular invoice that you want to print the invoice for. Hover over the printer icon and a list of different print documents will appear. The plugin allows you print different shipping documents with it. Select the document you want to print, in this case, invoice. A dialogue box will appear to print the document with the preview of the document. The generated invoice will look something like this. Print Invoice from the Order Details Page. With this plugin, you can also print an invoice from the order detail page of the individual page. Go to WooCommerce > Orders and then select the particular order. 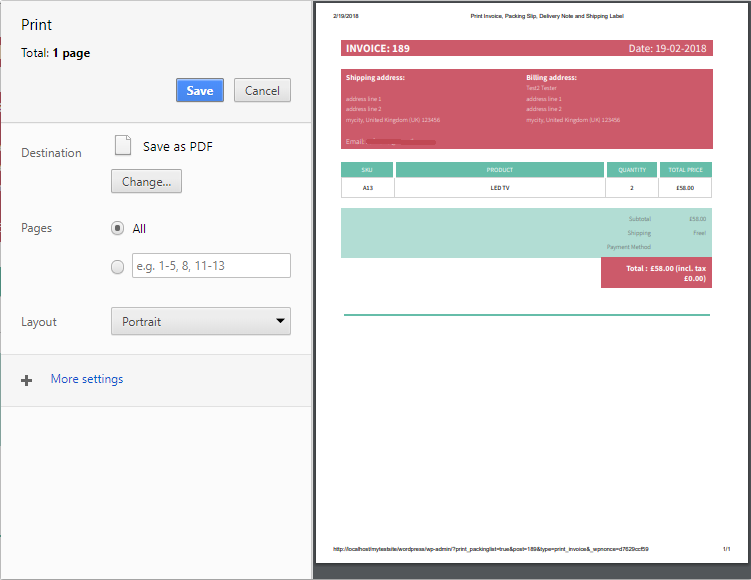 On the right side of the page, you have print actions from where you can print any of the given documents including the invoice. You can also print invoices in bulk from the Orders page. Select all the orders that you want to generate an invoice for. Then go to bulk actions and then change the product status to the status you set to generate an invoice. After you have changed the status an invoice will be generated and sent to the user’s email account as a PDF attachment. The plugin also has a premium version that gives much more control over the settings and the customization of the template that can help create invoices and other shipping documents to better match your business requirements.